Hey, California! Looking to get a Medical Marijuana Card Online or in-person? MMJ Doctor offers Exceptional Medical Marijuana Evaluations in California. Visit us in-person at 1884 Market St, San Francisco, 94102. MMJ Doctor is here to ensure everyone can be evaluated to see if medical cannabis is something that can benefit you with your medical conditions. Our California licensed cannabis doctors will never turn away anyone who needs an evaluation for medical marijuana. Under the Proposition 215, the Compassionate Use Act and proposition 64, passed by California voters in 1996 and November 2016, medical and recreational Cannabis is Legal in the state of California. You can grow your cannabis plants for medical and now for recreational use also. MMJDOCTOR offers superior customer service and the best quality marijuana ID cards. MMJ Doctor’s licensed weed doctors and staff are experienced, professional and considerate-committed to helping people who need medical weed. Our licensed medical marijuana doctors will explain your options in detail about getting your medical marijuana recommendation letter. If you are looking for the medical marijuana doctors who will be sympathetic and compassionate to your needs and will truly listen to your needs, MMJ Doctor is the best choice for obtaining your medical marijuana card. How to get a medical marijuana card or you want to find out how to get growers license in California – medical marijuana exemption card? How to get a medical cannabis card online or in-person? Give us a call and receive your cannabis card in an hour or even less. After you become a medical marijuana patient with us, you will receive a professional medical marijuana recommendation letter from a California Licensed Marijuana Doctor and a cannabis card that will allow you to Legally use marijuana in California. It’s easy for California patients to apply online. Simply complete the form and answer some questions; from here a licensed doctor will speak with you regarding your symptoms. Once approved by a licensed cannabis doctor, you will receive your marijuana card online, which will let you buy, possess, and grow medical weed and its associated products. With your letter of recommendation and medical marijuana card, you can now purchase medical cannabis at dispensaries across the state. Where Can I Get Weed In California? In order to get medical marijuana in California, you must first make sure you qualify, complete the online form, speak with a licensed cannabis doctor, and then get approved with a letter of recommendation. Getting the marijuana recommendation letter also results in you getting the ID card, both of which you need when purchasing medical marijuana from a California dispensary. The dispensaries you go to for medical marijuana will be different than those aimed at general adult users. While a dispensary can have both adult and medicinal licenses, people aged 18 years or older who have a doctor’s recommendation for medical cannabis are only allowed to purchase marijuana from dispensaries with medical use licenses. You can also have medical cannabis delivered to you if you live in an area that offers that service. NORML (National Organization for the Reform of Marijuana Laws) is an organization that provides helpful information and promotes the legalization of marijuana. California NORML is a state-specific subset of this organization, with its own separate membership, that aims to protect and inform Californians about marijuana rights and laws. This includes making sure people are not harshly criminalized for possessing or using marijuana and letting people know their rights as users in California, whether it’s for recreation or medicinal. The laws pertaining to those who are medical marijuana users (as opposed to general adult users) are covered under the Adult Use of Marijuana Act (AUMA), which allows adults aged 21 and older to purchase marijuana at dispensaries that are allowed to sell marijuana to adult users. Those who are medical marijuana users do not have to be 21, but if you are under 18, you must have a guardian to approve your usage. Additionally, if you are between 18 and 20, you are only allowed to purchase medical marijuana from dispensaries that have a license to do so (this is a seperate license than the one for general adult users). The rights related to those specifically labeled as medical users includes tax exemptions (if you have your ID card) and having no set limit on the amount of marijuana you can possess. 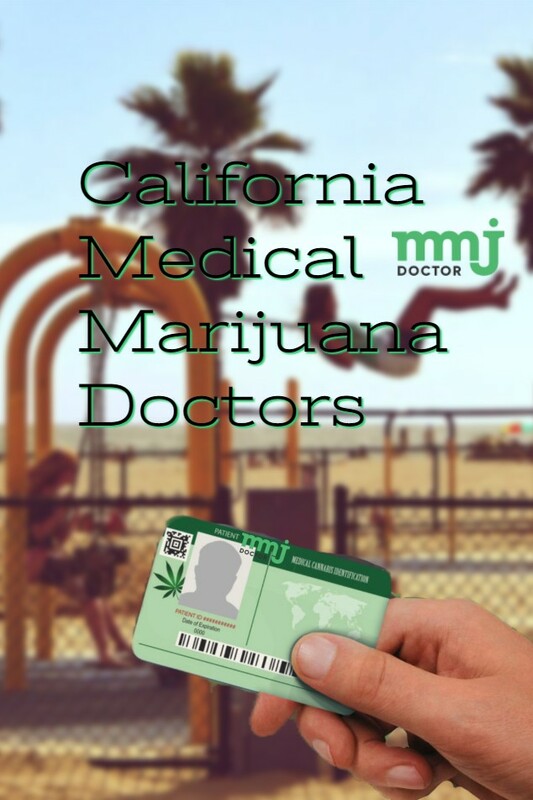 MMJ DOCTOR Clinic Providing Medical Marijuana Cards in California cities: Adelanto, Agoura Hills, Alameda, Albany, Alhambra, Aliso Viejo, Amador, American Canyon, Anaheim , Anderson, Angels Camp, Antioch, Apple Valley, Arcadia, Arcata, Arroyo Grande, Artesia, Arvin, Atascadero, Atherton, Atwater, Avalon, Avenal, Azusa, Baldwin Park, Banning, Barstow, Beaumont, Bell Gardens, Bellflower, Belmont, Belvedere, Benicia, Berkeley, Beverly Hills, Big Bear Lake, Biggs, Bishop, Blue Lake, Blythe, Bradbury, Brawley, Brea, Brentwood, Brisbane, Buellton, Buena Park, Burbank, Burlingame, Calabasas, Calexico, Calimesa, Calipatria, Calistoga, Camarillo, Campbell, Canyon Lake, Capitola, Carlsbad, Carmel-by-the-Sea, Carpinteria, Carson, Cathedral City, Ceres, Cerritos, Chico, Chino Hills, Chowchilla, Chula Vista, Citrus Heights , Claremont, Clayton, Clearlake, Cloverdale, Clovis, Coachella, Coalinga, Colfax, Colma, Colton, Commerce, Compton, Concord, Corcoran, Corning, Corona, Coronado, Corte Madera, Costa Mesa, Cotati, Covina, Cudahy, Culver City, Cupertino, Cypress, Daly City, Dana Point, Danville, Davis, Del Mar, Del Rey Oaks, Delano, Desert Hot Springs, Diamond Bar, Dinuba, Dixon , Dorris, Dos Palos, Downey, Duarte, Dublin, Dunsmuir, Eastvale, El Cajon, El Cerrito, El Monte , El Segundo, Elk Grove, Emeryville, Encinitas, Escalon, Escondido, Etna, Exeter, Fairfax, Farmersville, Ferndale, Fillmore, Firebaugh, Folsom, Fontana, Fresno, Fort Bragg, Fort Jones, Fortuna, Foster City, Fountain Valley, Fowler, Fremont, Fullerton, Galt, Garden Grove, Gardena, Gilroy, Glendale, Glendora, Goleta, Gonzales, Grand Terrace, Grass Valley, City Monterey, Gridley , Grover Beach, Guadalupe, Gustine, Half Moon Bay, Hawaiian Gardens , Hawthorne, Hayward, Healdsburg, Hemet, Hercules, Hermosa Beach, Hesperia Hills, Highland, Hillsborough, Holtville, Hughson, Huntington Beach, Huntington Park, Huron, Imperial Beach, Indian Wells, Indio, Industry City, Inglewood, Ione, Irvine , Irwindale , Isleton , Jurupa Valley , Kerman, King City , Kingsburg, La Cañada Flintridge , La Habra, La Mesa , La Mirada, La Palma , La Puente, La Quinta , La Verne, Lafayette, Laguna Beach, Laguna Hills, Laguna Niguel, Laguna Woods, Lake Elsinore, Lake Forest, Lakewood , Lancaster , Larkspur , Lathrop, Lawndale, Lemon Grove , Lemoore, Lincoln , Lindsay , Live Oak , Livermore , Livingston , Lodi , Loma Linda , Lomita , Lompoc , Long Beach, Loomis, Los Alamitos , Los Altos , Los Angeles, Los Banos, Los Gatos, Loyalton , Lynwood , Malibu , Mammoth Lakes, Manhattan Beach , Manteca , Maricopa , Marina , Maywood , McFarland , Mendota, Menifee , Menlo Park , Mill Valley , Millbrae , Milpitas , Mission Viejo, Monrovia , Montague , Montclair, Monte Sereno, Montebello , Monterey , Monterey Park, Moorpark , Moraga, Moreno Valley, Morgan Hill, Morro Bay, Mount Shasta, Mountain View, Murrieta, National City , Needles , Nevada City, Newark, Newman, Newport Beach, Norco, Norwalk, Novato, Oakdale, Oakley, Oceanside, Ojai Ca, Ontario, Orange, Orange Cove, Orinda, Orland, Oxnard, Pacific Grove, Pacifica, Palm Desert, Palm Springs, Palmdale, Palo Alto, Palos Verdes Estates, Paradise, Paramount, Parlier, Pasadena, Paso Robles, Patterson, Perris, Petaluma, Pico Rivera, Piedmont, Pinole, Pismo Beach, Pittsburg, Placentia, Pleasant Hill, Pleasanton, Plymouth, Point Arena, Pomona, Port Hueneme, Porterville, Portola, Portola Valley, Poway, Rancho Cordova, Rancho Cucamonga, Rancho Mirage, Rancho Palos Verdes, Rancho Santa Margarita, Redlands, Redondo Beach, Reedley, Rialto, Richmond, Ridgecrest, Rio Dell, Rio Vista, Ripon, Riverbank, Rocklin, Rohnert Park, Rolling Hills, Rolling Hills Estates, Rosemead, Roseville, Ross Town, St. Helena, San Anselmo, San Bruno, San Carlos, San Clemente, San Dimas, San Fernando, San Gabriel, San Jacinto, San Jose, Marijuana Doctors San Jose, San Joaquin, San Juan Bautista, San Juan Capistrano, San Leandro, San Marcos, San Marino, San Mateo, San Pablo, San Ramon, Sand City, Sanger, Santa Clara, Santa Clarita, Santa Fe Springs, Santa Maria, Santa Monica, Santa Paula, Santee, Saratoga, Sausalito, Scotts Valley, Seal Beach, Seaside, Sebastopol, Selma, Shafter, Shasta Lake, Sierra Madre, Signal Hill, Simi Valley, Solana Beach, Soledad, Solvang, Sonoma, South Gate, South Lake Tahoe, South Pasadena, South San Francisco, San Francisco, Stanton, Suisun City, Sunnyvale, Sutter Creek, Taft, Tehachapi, Tehama, Temecula, Temple City, Thousand Oaks, Tiburon, Torrance, Tracy, Trinidad, Truckee, Tulare, Tulelake, Turlock, Tustin, Twentynine Palms, Union City, Upland, Vacaville, Vallejo, Vernon, Victorville, Villa Park, Vista, Walnut, Walnut Creek, Wasco, Waterford, Watsonville, Weed, West Covina, West Hollywood, West Sacramento, Westlake Village, Westminster, Westmorland, Wheatland, Whittier, Wildomar, Williams, Willits, Windsor, Winters, Woodlake, Woodside, Yorba Linda, Yountville, Yucaipa, Yucca Valley.